SENSENICH, in their time was America’s largest manufacturer of light aircraft propellers. For decades Sensenich engineers and craftsmen have been designing and building wooden propellers for America’s personal planes. That’s why you would have found the famous Sensenich winged trademark more often than any other on new aircraft (under 250 HP) rolling off the line, on the ground or in the air – any time, any where. A Sensenich propeller is your guarantee of top performances from any engine, any aircraft, boat or sled.All Sensenich fixed pitch wood type propellers are constructed of aircraft birch or maple laminations bonded together by moisture proof phenolic resin glue with the glue lines running parallel to the chord line. The leading edges are protected against abrasion by metal leading edge strips and cap tips, fastened to the propeller by steel screws and copper rivets. Approximately 12 inches of each blade tip is also further reinforced and protected by a sturdy fabric or plastic covering glued to the wood. The wood is protected against moisture by the application of two dip coats of a varnish type wood sealer and two spray coats of a special spar type propeller varnish. a. Faster acceleration giving shorter take-off run. b. Greater rate of climb and angle of climb at a lower airspeed. c. Increase in cruising speed will vary in airplanes of the same make and model depending upon the power used by the pilot. d. There is a noticeable increase in cruising speed at low altitudes –but the percent of increase is usually doubled or tripled at altitudes over 5000 feet. e. More efficient cruise operation may usually be obtained by adjusting the high pitch, setting of the controllable propeller to yield a relatively low value of r.p.m. at a high throttle setting. This results in more economical engine operation and increased propeller efficiency. “Skyblade” propeller was approved by the Civil Aeronautics Authority with the following ratings:Model C-2FB, C-2FM & CS-2FM. TC No. P-841. Rated: Maximum except take-off 112 hp at 2665 RPM. Take-off rating 115 HP at 2875 RPM.Model C-3FR (illustrated), CS-3FM & CS-3FR. Rated: Maximum except take-off 165 HP at 2800 RPM. Take-off rating 165 HP at 2800 RPM. Model CS-2FM. Cockpit controlled selective RPM propeller. Rated: Maximum except take-off 112 HP at 2665 RPM. Take-off rating 115 HP at 2875 RPM. That is why you can swing a SENSENICH and be sure – whether it is standard equipment on your new ship, or a replacement prop on your old. Available for aircraft under 250 h.p. 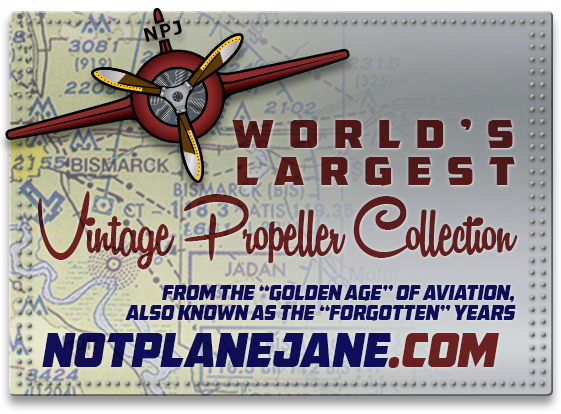 Sensenich propellers are standard equipment on such famous planes as Aeronca, All American, Bellanca, Call, Cessna, Commonwealth, Consolidated, Culver, Engineering and Research, Fairchild, Funk, Grumman, Luscombe, Piper and Taylorcraft.